Former Turks Bat Boy and Equipment Manager, David Huddle, Honored for Saving Life. Turks Tidbits Harrisonburg, VA For everyone that knows the John Huddle Family you know what hard working, dedicated, and humble people they are. You also know how important they are to the Harrisonburg Turks, and to the Wease Family. John and Sharon have worked the grill and fed Turks fans for years their famous Huddle Burgers. Their son, David, has been a very special part of our family since he and Matt were growing up together and they spent hours on the baseball field (little league, HHS, and the Turks Veterans Memorial Stadium). He worked as one of the Turks bat boys and then as the equipment manager since he was about 10 years old. He was a great and helpful friend to a lot of Turks players and coaches during those years. David has left baseball behind and moved on to going to college and working full time for the Rockingham County Fire Dept and pursuing a career in firefighting. We have always loved David and been proud of him but even more so this summer when we heard of his latest daring adventure. He’s been honored for his heroism in saving a man’s life in a fire and I knew all of you would want to hear about it. Please read the article below from the Daily News Record on September 5, 2009. BRIDGEWATER – David Huddle doesn’t see what the big deal is. 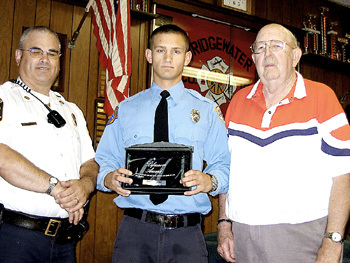 The 19-year-old responded to a fire not far from his home on May 21. That night, Huddle, a volunteer and career firefighter, pulled his neighbor from the burning house, likely saving the man’s life. He says he was just doing his job, but others don’t quite see it that way. News of his efforts reached Jim Werner, a retired Harrisonburg firefighter who now lives in Roanoke. Werner nominated Huddle for a life-saving award from Woodmen of the World, and presented it to him Friday. Huddle was at home when emergency crews were dispatched to 861 Madison St. in Harrisonburg. So, he hopped in his truck and was first on the scene of the house fire, where flames were coming out the front window. Inside, he saw a man lying on the floor. Huddle grabbed the man by his feet and pulled him 8 or 10 feet out of the house. The man was taken to the University of Virginia Medical Center, where he was treated for burns and smoke inhalation. “I don’t feel it’s quite as big a deal as everyone’s made it out to be,” Huddle said. His father, Rockingham County assistant Fire Marshal John Huddle, disagrees.